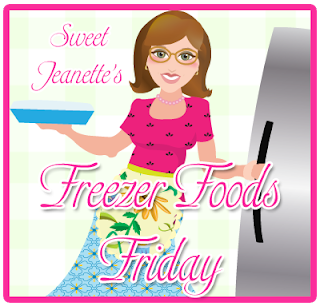 I hope your as excited as I am that Freezer Foods Friday is making a comeback. It's been a while and I've missed it. Here's a little , er... educational introduction... to kick us off. This might be "old news" to you, a refresher, or a new slant. However you receive it, I hope there is something you can use or add to. There are many types of "freezer cooking" methods. There's the OAMC (Once a Month Cooking); TAMC (Twice a Month Cooking); Mini Sessions, preparing meals by categories...The methods and lists are as vast and varied as individual's tastes. You can have a card-file system or notebook file system. I use the notebook pages because I can have each recipe printed on an individual page, put in a page protector and place in a three ring binder. You can see my post about organizing my recipes into notebooks by clicking here: Organizing My Recipes from Magazines, etc. Menu - You might like to fly by the seat of your pants, but you really need to do a menu. You don't really want a month of all Mexican, or Italian food do you? There are all sorts of sites with good forms to print out for menus and I've used a lot, but in a pinch, I like the old, take a sheet of notebook paper, fold it in half, fold it again, and again. Unfold and you've got 8 blocks. Yeah, I know there aren't "usually" 8 days in the week, contrary to what the Beetles said! (I'm showing my age aren't I). 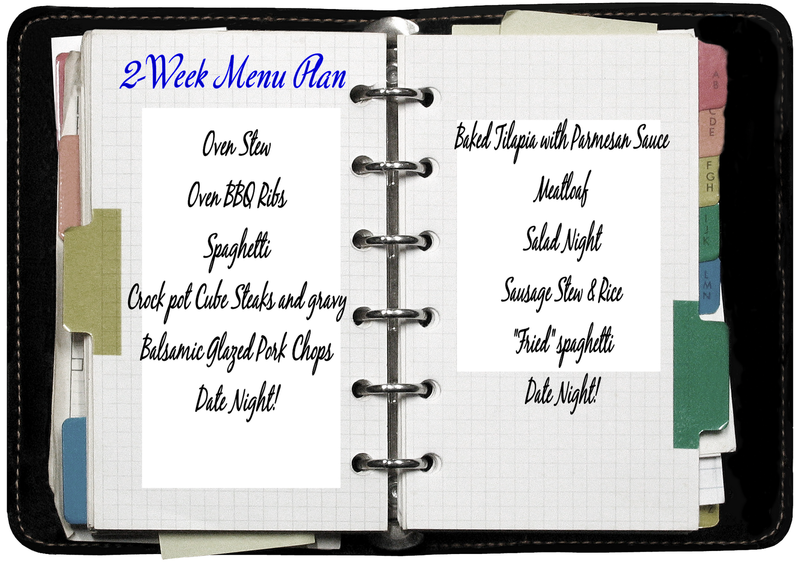 Just fill in the 7 blocks with a day's menu. Super simple, right? Try only a few new recipes each month. (That way if it flops, it was only one meal) Your menu should be mostly ones your family already likes. And I can't stress this enough... Label your foods! In a month or so, you won't be able to tell the difference between chicken broth and squeezed lemon juice (for lemonade) by just looking at that freezer bag. Trust my experience, here. I like to buy steaks and chicken when they're on sale. My husband is the designated "griller" in the family and he's a steak kinda guy. I don't make my marinade for the beef, but I buy a marinade called "allegro". I really like the flavor of this. So, what I do, is when our local grocer has steaks buy one get one free (I love those deals!) I buy what they will allow, bring them home and place in a zippered type freezer bag, pour the marinade into the bags and freeze. When we're ready for grilling, I take them out to thaw in the frige and while they're thawing, they're marinating. Win Win! Ok, I can't leave chicken out, can I? Here's a couple of great freeze-in-the-bag-with-chicken marinades. If you will notice one recipe I used as a marinade is from the recipe that everybody was making a while back...You know, the Apricot Chicken recipe? Well did you know it makes a great marinade for grilling chicken? It does! 12 oz jar of apricot preserves - heated in the microwave until runny. Alright, if I haven't bored you to tears yet, I want to leave you with one more recipe. Would that be ok? I've had this for probably 18 years or so, and I've made them into little (portion controlled) muffins, with a crust, without and called it a casserole, you name it. But it was originally called Crustless Quiche. It's great to fix ahead and have for holiday breakfasts or brunch. cooked and crumbled bacon (equal 10 slices) I cheated, see pic?! Add milk, flour, baking powder and salt to eggs and mix until smooth. Add egg mixture to cottage cheese and mix. Stir in shredded cheese, bacon and onions. Now here's where you choose... Do you want to bake and freeze, or just freeze? bake at 375 degrees for 12-15 minutes or until edges are lightly browned. I chose to pour the mixture into freezer bags to bake later. When I'm ready to bake 'em, I'll just thaw in frige and follow the above instructions.